My first rescue of the new year happened in Mississippi. 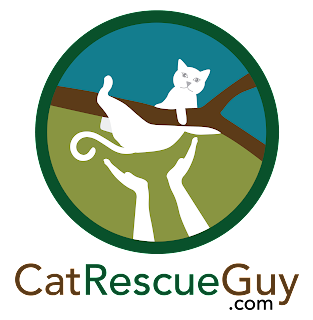 My friend, Bob Reese, the only cat rescuer in the whole state of Mississippi, called me to see if I would be willing to take a rescue call he got from the southern part of the state. Bob was unable to get to it that day, so he offered it to me. The cat had been in the tree for four nights already, and the owners were distraught. I was free, so off I went. When I arrived, I met Scott and Nikki, the owners of the cat. Scott's parents, Lee and Gale, were also on hand to watch the rescue. They had tried everything they could think of to help their cat, Porche, down, but nothing worked. Sleep at night was difficult when they could hear Porche's pitiful cries just outside. 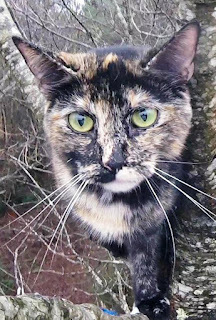 Porche is a one-and-a-half year old tortie and spends all of her time indoors. She has slipped out the door before but always stayed very close and was always anxious to get back inside. This time, however, for whatever reason, she found herself stuck in a tree in the front yard. She had spent most of the time about 25 feet high, but the day before I arrived, she went up to 35 feet near the top of the tree. I set my rope on a sturdy branch well below her and gradually worked my way up to her. She cried out every now and then and remained calm most of the time. When I got close enough to reach up to her, I let her sniff my hand. I came up a little closer and tried to touch her. She was not comfortable with my touch at first, but she got used to it pretty quickly. Since Porche was in such an uncomfortable position on small branches, I thought she would love the chance to step inside a carrier where she could spread out and get comfy. I held the carrier up to her, but she showed no interest in it. I thought that she might have more interest if there was food inside, so I opened a can of food. She was mildly interested in the food and eventually took a bite, but it was not exciting her as much as I had wanted. Still, I put the food in the back of the carrier and held it up to her. Again, she showed no interest. I put the carrier away and prepared the gloved bag. After getting a little higher for better access, I petted her some more and got her comfortable with my hand on her scruff. When we were ready, I grabbed her scruff and gently pulled her up and out of her perch and pulled the bag over her. She took it like a champ without struggle or complaint. Back on the ground, I handed her to Nikki who took her inside and released her there. Porche filled her belly with water and food and was very happy to have so many comfortable places to rest. Nikki sent me this picture of her, and I am very happy to know that Porche and Nikki both can now get some needed rest.